In advance of our performance playing support for OM at the Rainbow Warehouse in Digbeth, here’s some proper effects-geekery which may be of marginal interest to folks who enjoy making a racket with amplified tubas. Of which there aren’t all that many. Hey ho. I’ve recently made some changes to my live setup to remove some kit that wasn’t, in the final analysis, working too well. The Danelectro “Reel Echo” tape delay simulator I’ve used previously may come back into play at some point if we can find a way of stopping it from clicking when brought into the circuit. 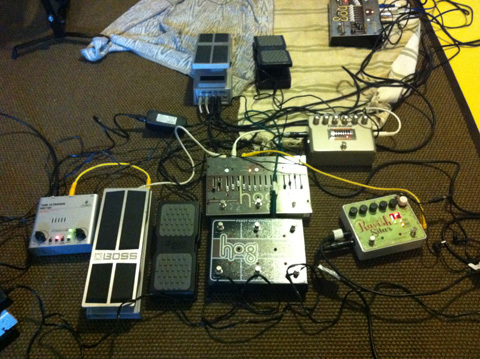 Also gone is the Bass Big Muff. Amazingly, despite how good it is with electric bass, it simply doesn’t give a meaty enough distorted sound with tuba when used with settings that prevent constant howling feedback. At higher gain, it’s OK, but then there’s all the screeching, and The Jesus and Mary Chain we are not. 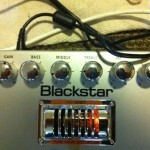 My biggest recent revelation was my discovery of Blackstar equipment. 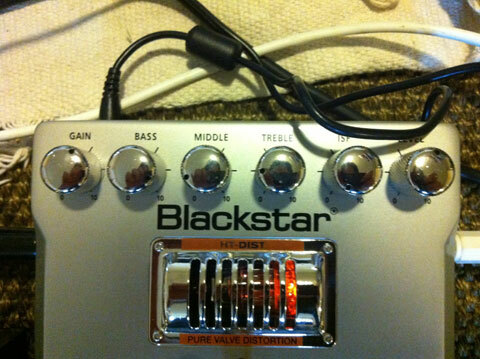 If you don’t already know, Blackstar comprises various folks who used to work at Marshall, and are dedicated to producing high-end valve-based gear. Buying the HT-DIST (HT stands for high tension – because they come with a step-up transformer to give you the necessary voltage) was a bit of a gamble, because you can’t try pedals out with a tuba in a guitar shop. BUT the gamble paid off. This thing is magnificent with tuba. It preserves all the low end and you get a fabulous warm, rich, distorted sound. 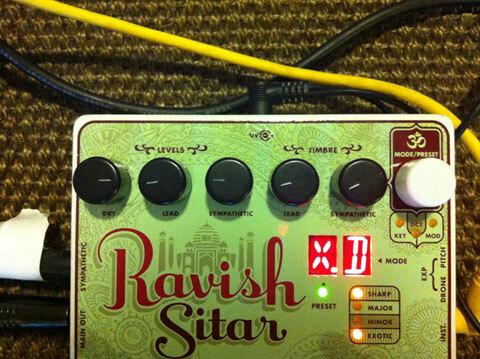 In place of delay I’ve added my EHX “Ravish Sitar” pedal. 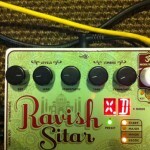 It not only processes the signal to give a sitar-like lead sound (which I turn right down to get the dry signal only) but has a second output which gives sympathetic resonance, just like having loads of sympathetic strings on an Indian classical instrument, without quite so much faff in tuning them. It allows you to select the scale you want – tonight, Matthew, I’ll be using an Eb Raga Bhairav scale, and even program in custom ones. Appropriately enough, it has a nice “om” symbol on it, too. 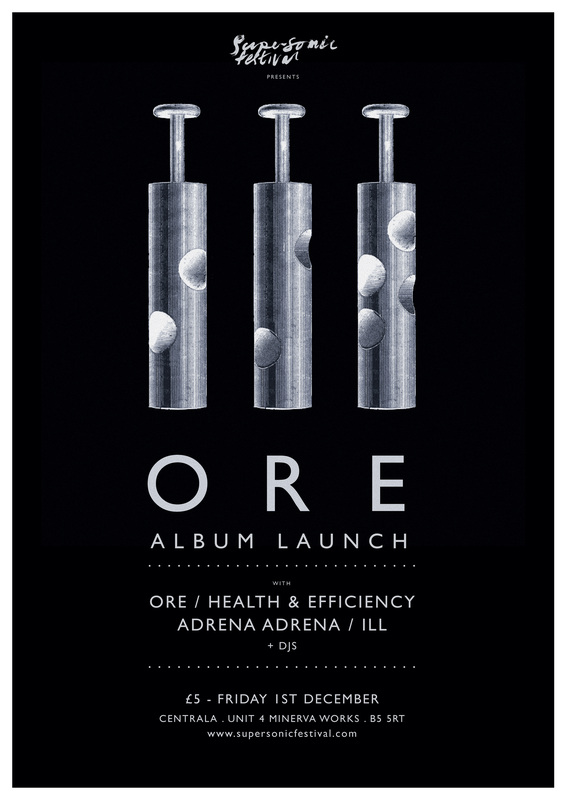 On the 25th of February, we have our third formal performance as ORE, featuring our special guest, Alex Sramek. We are so pleased to be playing in Bristol and at such a great venue as The Cube Cinema, an old favourite of ours. In the run up to our gig we will be spending some time in the studio exploring our collaboration with Alex and his contrabass clarinet, the sound of which is something to behold. We will be developing some ideas for our performance, recording some bits and getting out and about to odd venues to explore the effect of our surroundings on our sound, and for some pop-up performances. These will mainly be around Birmingham and Worcester and might be over before you even get there…but if you want to be kept informed about what we are up to, please check our updates on Twitter. We hope to see you at some point on this journey. We are very excited to have Alex over from the US to work with us. This is a rare combination and we hope you will come to hear / witness it in Bristol on the 25th February, or at least one of our pop-up performances beforehand. We like to collaborate with like-minded musicians, which is why we were delighted when Alex Sramek got in touch with us towards the end of 2011. It was obvious from the first conversation that we should make some noise together. Alex plays contrabass clarinet and has been described by The Clarinet as “The world’s loudest clarinet player”. 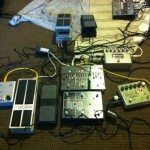 He also shares our love of long, low drones and improvisation. Alex is coming to the UK in February for the SABRe (Sensor Augmented Bass clarinet Research) event at Keele University. It seemed like an obvious opportunity to get some stuff done together, culminating in a live performance together at The Cube Cinema in Bristol on the 25th – lovely poster below, designed by another Alex. 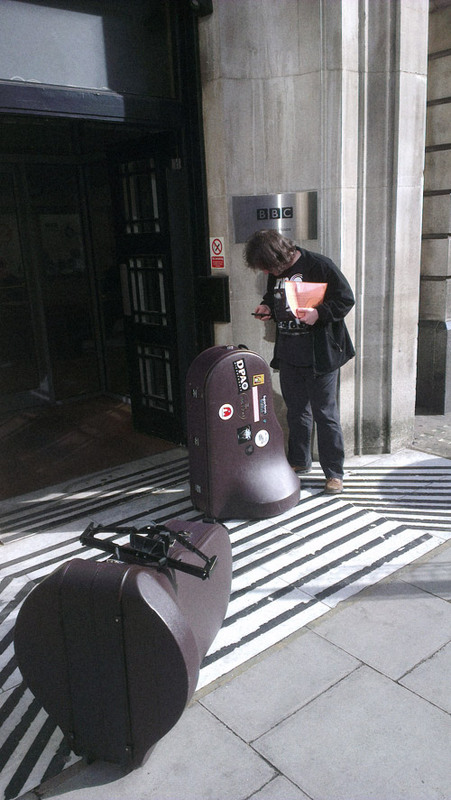 We are currently trying to organise something to take place in Birmingham while Alex is over, alongside some recording time, pop-up performances (well, not that pop-up with two tubas and a contrabass clarinet), playing in some odd spaces, etc. If you’d like to suggest something you want to see / hear us do during the last couple of weeks in February, please get in touch or post a comment below. A couple of photographs of ORE playing live at Supersonic Festival, 2011. Thanks to Mick Underwood for these.